During the events of the revolution of 1848-1849 in Transylvania, Sibiu was an important decision center of leading the action and disseminating the program of the social and political national protests. Sibiu was one of the meeting points of the Romanian revolutionists in Transylvania and was also the place where the National Assembly's program from Blaj in 3-5/15-17 was developed in May 1848 and also the headquarters of the Romanian National Committee elected by the Great Assembly on Campia Libertatii (the Field of Freedom). In Sibiu, Simion Barnutiu, at that time a student at the Faculty of Law, conceived and drafted in March 24, 1848, the anti-unionist manifesto. He sends the proclamation to the Romanian students in Blaj, Cluj, Brasov with the request that every student makes a copy and sends it to their home place. On 26 April / May 8 a meeting takes place in Sibiu which, besides local leaders, was also attended by delegates from Blaj. Barnutiu presented a project program focused on the following major ideas: the independence of the Romanian nation, taking the national oath, the protest against the "union" with Hungary. During the same meeting, the colors of the flag for the Nationa Assembly in Blaj were chosen: blue, white and red (the colors of the French Revolution) and on the flag - made in Sibiu - were written in gold letters: "Liberty, equality, fraternity" and "Romanian virtue revived". Romanian intellectuals from the Kingdom of Romania and a group of Moldavian revolutionists in exile: Alecu Russo, Costache Negri, G. Sion, C. Epureanu, C.A. Rosetti (sought by authorities) found refuge in April 1848 in Sibiu, where the administration was in the hands of the Saxons who protected them or ignored the revolutionary actions. Thus, Sibiu became the center of the Romanian revolution in Transylvania, where all the antagonistic forces against the Hungarian revolution were concentrated, beginning with the officials arrived from Vienna, officers of the Imperial Army and members of the Saxon patriciate. On 3 April, the Saxon University decides that Romanians can be appointed in communal and district offices; that their children can learn from Saxon craftsmen and that Greek Catholic and Orthodox churches can receive agricultural plots. On 18 May, the "Saxon University" convenes a meeting in Sibiu, with delegates from all areas inhabited by Saxons who were against the "union" and on May 22 they sent a message to the Emperor stating that Transylvania's "union" to Hungary is a great danger to the Austrian monarchy and Saxons interests. The Permanent Committee from Sibiu was the first representative political organization that Romanians held until then. The Committee in Sibiu had two periods of activity. Elected at the second Assembly in Blaj, the committee worked from 4/16 to 17 august when it was abolished by the Hungarian government. In the second period, the Committee elected at the Third Assembly in Blaj on September 25, will function on Avram Iancu Street. 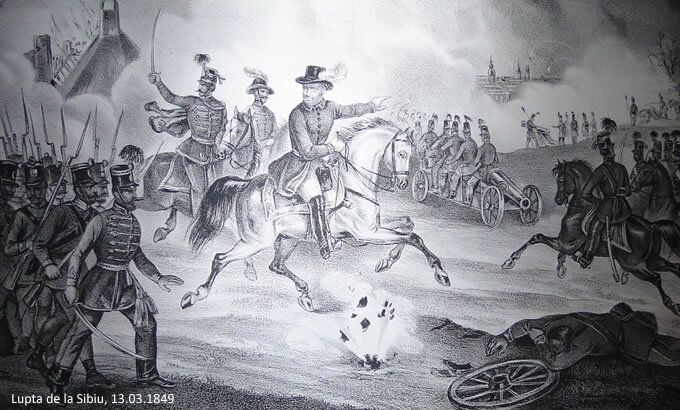 When General Joseph Bem's troops entered the city on the night of 11 March 1849, the Committee was dissolved and its members managed to escape to Kingdom of Romania, with the help of the peasants' from Marginimea Sibiului (surrounding areas of Sibiu).